Metal Machine Music to be released on vinyl, DVD-Audio and Blu-ray | What Hi-Fi? Reed will release the ground-breaking album in the UK on April 19th on his independent label Sister Ray in three formats: double gatefold vinyl in quadraphonic sound, DVD-Audio and Blu-ray. The album coincides with Lou Reed's Metal Machine Trio UK concerts at the Cambridge Junction (April 17th), Oxford O2 Academy (April 18th) and London's Royal Festival Hall (April 19th). Reed did the digital re-mastering from the original multi-tracks with the help of re-mastering 'guru' Scott Hull. This is a new and improved re-mastered version, he says, and is different from all previous releases on the RCA, Buddha and Sony labels. "The out of print 'Quad' release has been replicated for all formats, including a perfect vinyl version playable on your stereo turntable with the original rear sections moved to the centre of the front left/right speakers," says Reed. "It's worth getting a turntable just to hear this. We worked from digital transfers (96kHz/24-bit) made from the original analogue masters. The original label supplied us with these files and photocopies of the analogue reels including copies of Bob Ludwig's mastering notes." 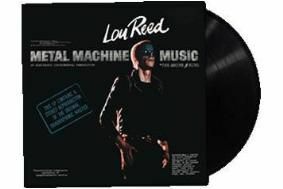 Full details of the Metal Machine Music re-issue can be found on this website, and for more information on Lou Reed's Metal Machine Trio tour, visit the official Lou Reed website.